Our outside space is becoming more and more precious and we are taking on more of the outdoor lifestyle. With products becoming more durable it is more feasible to leave rattan chairs outdoors all year and them not perish. 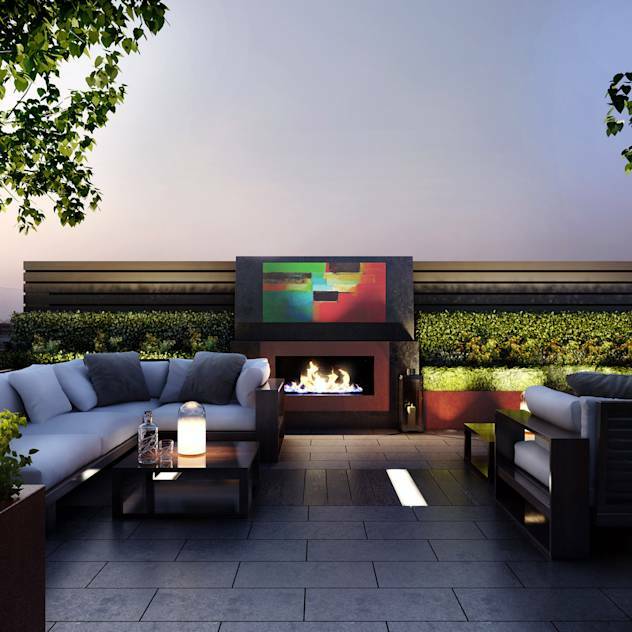 Outdoor heating has also become more stylish and usable so we don’t get cold. 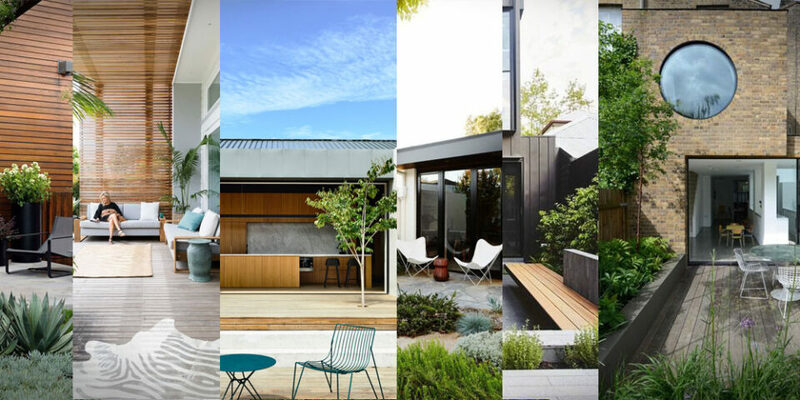 I have picked 10 outdoor patio designs that look great and bring so usable style to our new favourite social spaces. 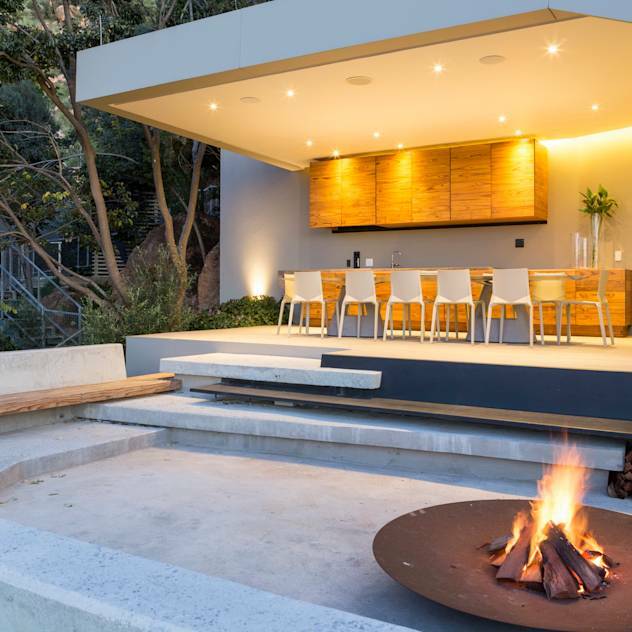 Designed by Aralia this dusk setting is a warm and inviting space to sit out and enjoy the night. The fire flickers in the background and the uplighters set an atmospheric mood. Gregory Philips has built a reputation for some stunning contemporary design and this is another of his teams works. 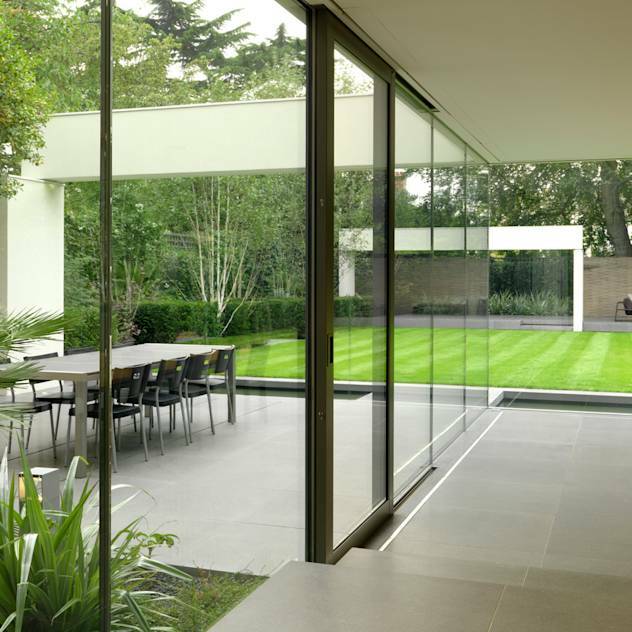 Perfect linear design with a usable and functional space for outdoor social entertainment. It is very clinical in it execution but stylish with it. If size is not in abundance for you the worry not. 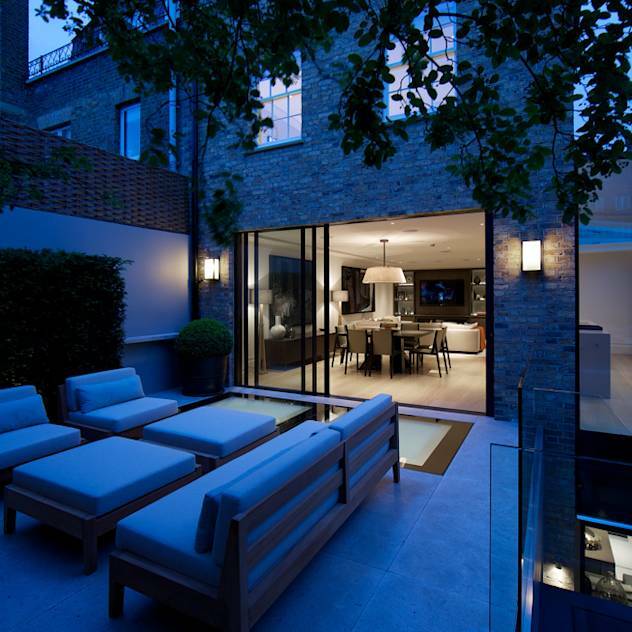 This courtyard space demonstrates that it isn’t necessary and that a warm and cosy atmosphere can be achieved with the right additions. The use of a mirror helps to expand the space visually and cedar wood cladding softens the imposing height of the stone wall behind. 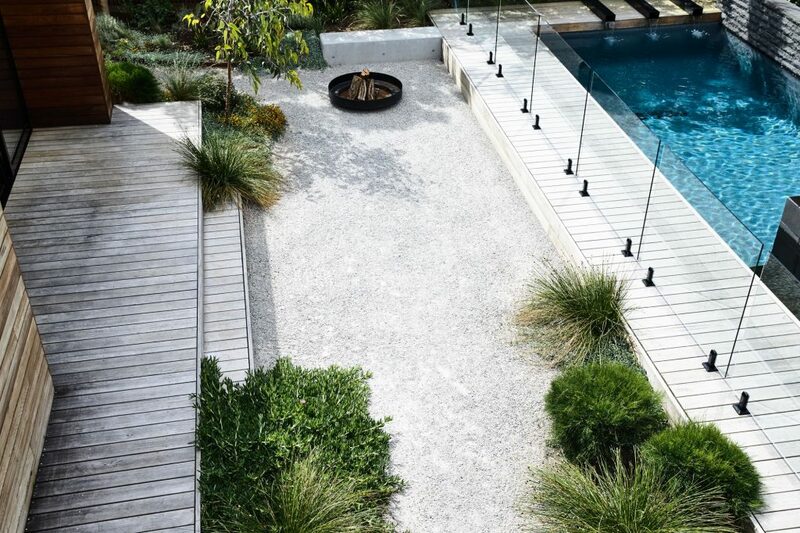 Fire pits are a great way to add moving features to our gardens and this one has a stunning pergola backdrop. Whilst not the most efficient way of heating they do give the opportunity to play on mans fascination with fire while not damaging the nice patio beneath. Gregory again delivers another stylish patio. This time a dark wood deck set in forest with views over rolling hills. The raised position give the users a different perspective over their land and a wonderful spot to sit and wathc the sun go down while drinking a fine wine. 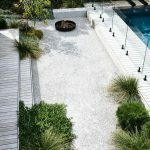 The white contemporary stone of Garden Plan’s offering give their design a light and welcoming feel. 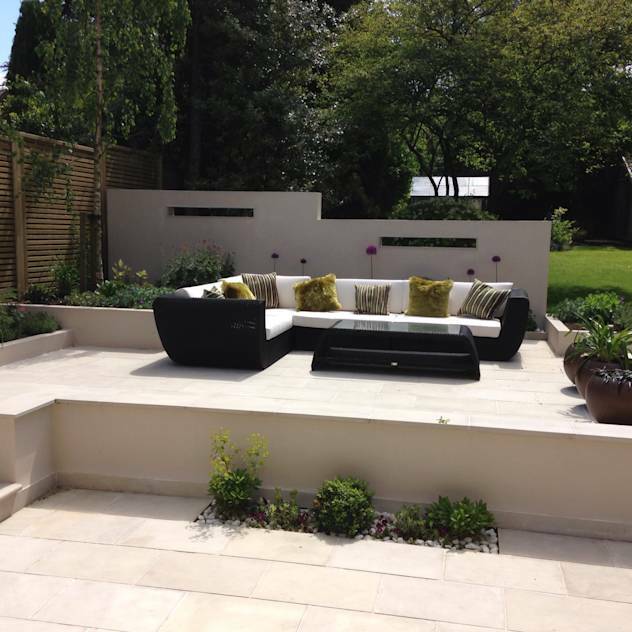 With a raised section it separated the area from the rest of the garden and allows viewing of it from a massive cosy sofa. In contrast to the previous 2 design this does not play with levels to change the viewers perspective. 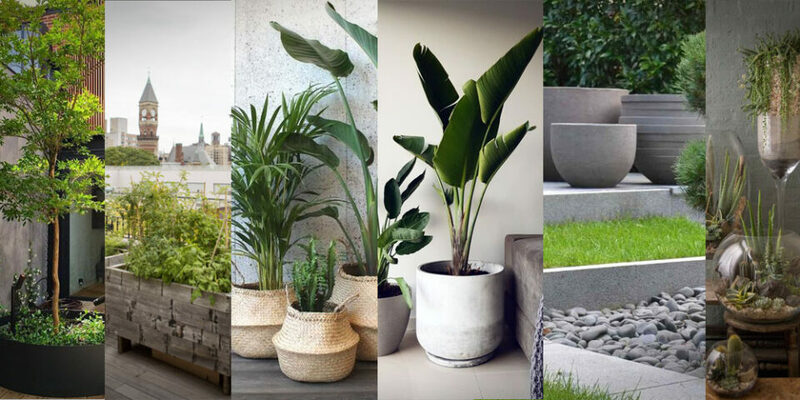 Instead the garden is broken into sections using distinct planted areas and walk ways. 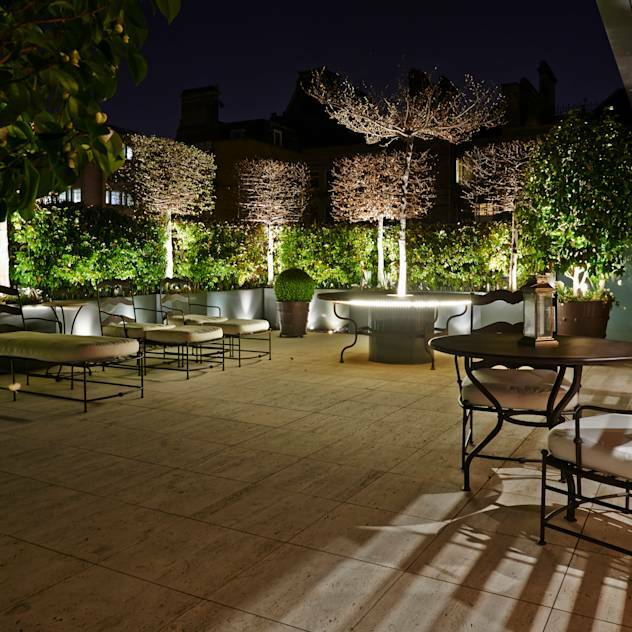 The tall trees help to add varying height to the design and in time will offer more of a visual break up of the space. 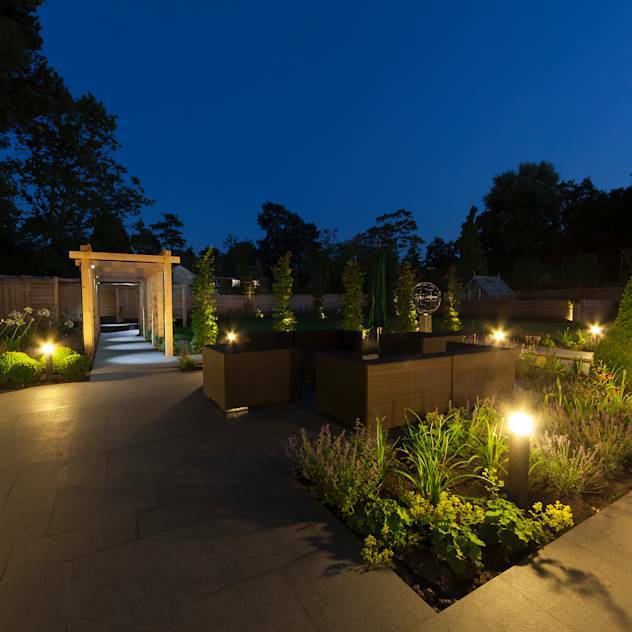 A much more traditional design than the others but still with a modern edge this London garden looks great uplit at night. 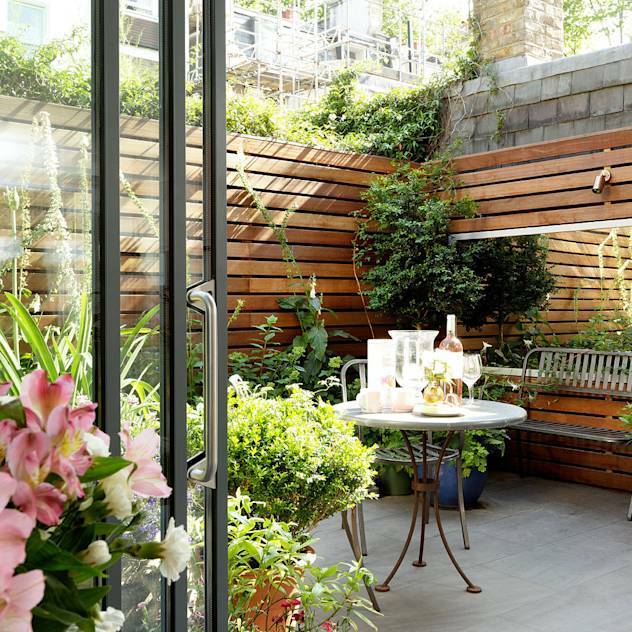 The patio is completely paved but foliage is added in containers and planters around the edge to provide cover and warmth but still maximise usable space. Aerial Photos always make me look as they offer a different view of everyday settings and tap into our fascination with flight. 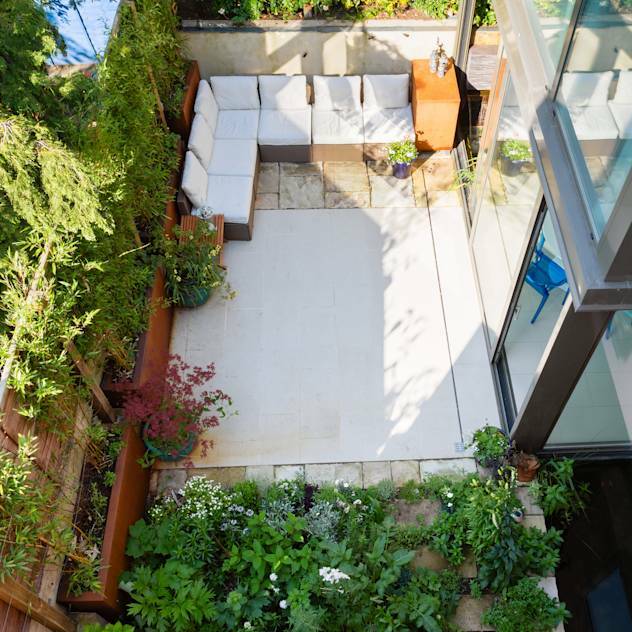 With the increase of drones we are seeing more and more homes from new angles and this courtyard space by Granit is full of foliage at one end and seating at the other while leaving space in between for standing socialising. 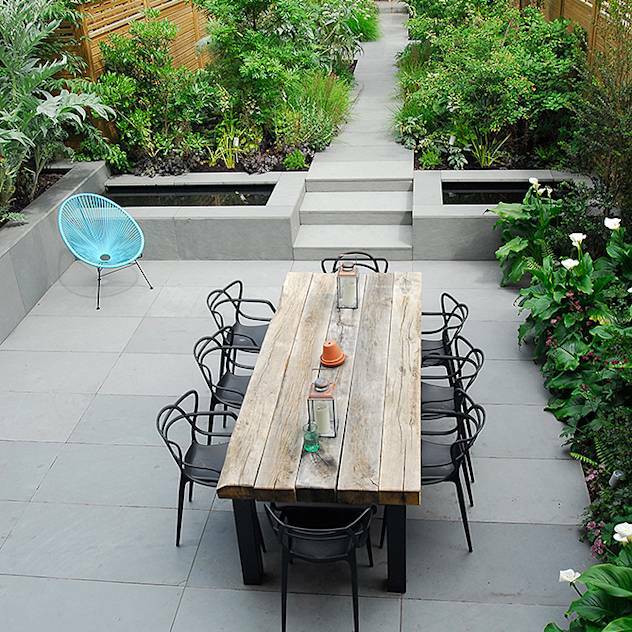 Taking the garden as a usable space is not always the brief that people give. Josh Ward here has set most of the garden to planting with a viewing pit at one end so the owners are submerged into a jungle of plants.